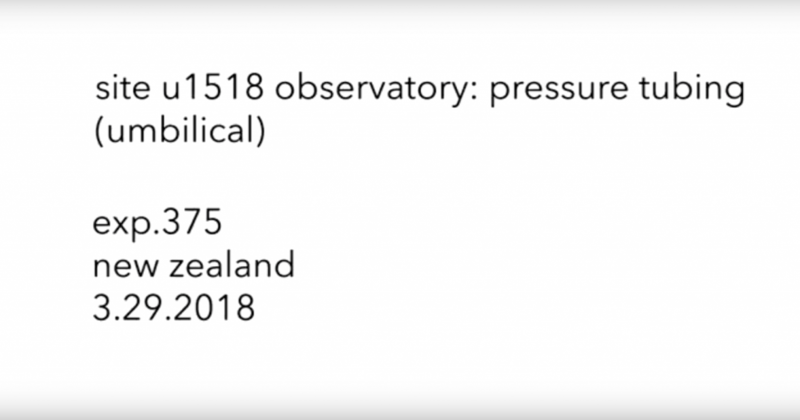 This video shows the first stage of installing the Te Matatike observatory. Here the team is strapping pressure lines to the outside of the casing, which will be lowered into the borehole we have already drilled, 1409 feet (427 meters) below the seafloor. The pressure lines will connect three zones: above, within, and below the fault zone, to sensors at the Te Matakite wellhead, in order to measure fluid pressure changes over time in this area of slow slip earthquakes. The observatory specialists have carefully worked out the three depths using both the core data we collected last week, alongside logging while drilling (LWD) data collected on Expedition #372 in November last year.